The I think for adult dogs of True Instinct Original Medium – Maxi with chicken provides your pet a number of natural ingredients to enjoy a balanced diet, healthy and with a delicious taste to chicken. This dry food is made with high-quality products, all natural, and is especially indicated for adult dogs of breeds large and medium-sized, such as labradors, German shepherds or mastiffs of between 10 and 55 kg weight. Feed True Instinct is formulated with a variety of natural ingredients including vegetables, fruits, and grains, and have as main component the meat, which in this case is the chicken. This way, your pet will be eating the amount of protein, fiber and carbohydrates necessary for your body to function perfectly. The benefits that I think of chicken True Instinct to give your dog are varied and complete. On the one hand, the chicken, the main ingredient of this food, is a contribution of protein high for your best friend, keep the muscles healthy and well developed and you can enjoy the walks and the exercise that you daily share with him. You'll also find in your composition whole grains, along with fiber with effect of prebiotic, will lead to the digestive comfort of your best friend, helping you to have a good digestion. The essential fatty acids omega 3, omega 6 and zinc will be in charge of taking care of the hair and skin of your pet, giving it a magnificent appearance and health. The food is full with vitamin E, vitamin C and selenium, components with a high antioxidant power and your immune system will be strengthened thanks to the proteins and the zinc. That's why I think True, Instinct is a source of well-being for your dog, which, in addition, you will enjoy every bite thanks to its delicious chicken flavor. 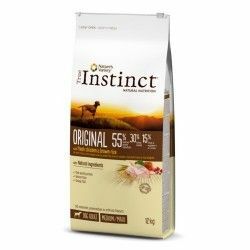 True Instinct has a range of natural foods designed for every dog, they have products for dogs, medium and large, small, gluten-free foods and feedstuffs specific to puppies who will answer any nutritional needs required by your pet. Dry food for adult dogs made with natural ingredients and of great quality. With whole grains that provide carbohydrates, protein and fibre necessary for the body. I think specifically designed for adult dogs of large breeds and medium sized enterprises. Maintains and improves the muscles of your pet favoring in turn the level of activity. Contributes to the digestive comfort of the dog and strengthens your immune system. I think dry and nutritious with chicken for adult dogs, specially indicated for breeds medium to large 10-55 Kg of weight, made with natural ingredients that act in the well-being of the organism. Ingredients: chicken (23%, with 4% of chicken thighs), chicken dehydrated (18%), brown rice (12%), whole barley (13%), peas-dried, butter (6%) stabilized with natural tocopherols, pork, dehydrated (4%), oats, hydrolyzed protein (3,5%), beet pulp, flax seed, minerals, fish oil (0,5%), apple powder (0,35%), dried carrots (0,35%), broccoli, dried (0,15%), red fruits, dehydrated (0,01%). Constituents analytical: protein (29%), fat (19%), crude fibre (3%), inorganic matter (7,5%), omega-3 fatty acids (0,4%), omega 6 fatty acids (2.3 per cent). Nutritional additives (per kg): vitamin A (30000 lU/kg) vitamin D3 (2000 lU/kg), vitamin E (450 mg), vitamin C (350 mg), ferrous sulfate monohidratado (237 mg), potassium iodide (1.7 mg), copper sulfate pentahydrate (30 mg), sulfate reduction monohidratado (112 mg), zinc sulfate monohidratado (527 mg), sodium selenite (0.2 mg). Each animal is different and has some specific characteristics that define it, for this reason, the dose of food that should be fed daily your pet will depend on the weight, the physical activity that you perform, and your general condition. The rations contained in the table are indicative, so you'll have to adapt them to your pet. If this is the first time that it's going to take this food, it is advisable to make a gradual change of the I old to the new. Retains the feed in a dry and cool place. Prevents children from having access to him. Always leave fresh and clean water within reach of your pet to drink when you need it. Description: The I think for adult dogs of True Instinct Original Medium – Maxi with chicken provides your pet a number of natural ingredients to enjoy a balanced diet, healthy and with a delicious taste to chicken.